Rev Ian Smith celebrates his first communion as a priest. 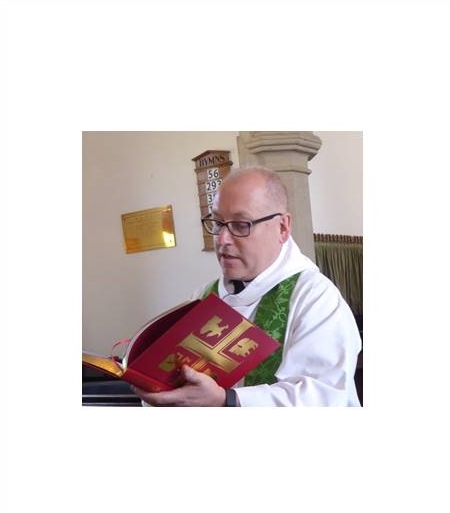 On Sunday 1 July 2018, the day after his priesting at St Albans Abbey, Ian Smith led his first communion. The service was a United Benefice service, held at St James the Apostle Pulloxhill, and attended by over 110 people from across the Benefice. Introducing the service Dave Bell congratulated Ian Smith on his priesting and commented on what a wonderful and moving service it had been the day before. The theme for the service was based on the Benefice mission “Growing as a beacon of Christ’s light in our communities”. A special collect for vision was used in the service and the intercessions from Maggie Jeeves also focused on the importance of vision and the importance of communities. In his sermon, Dave Bell focussed on the important role each and every one of us has, as Christians, to work together to build and maintain better communities. He highlighted the benefits offered by a Benefice of three Churches as there exists a range of experience, skill and enthusiasm that can be focussed on improving the communities in which we live and worship. Ian reading the gospel from the bible presented to him at his priesting. 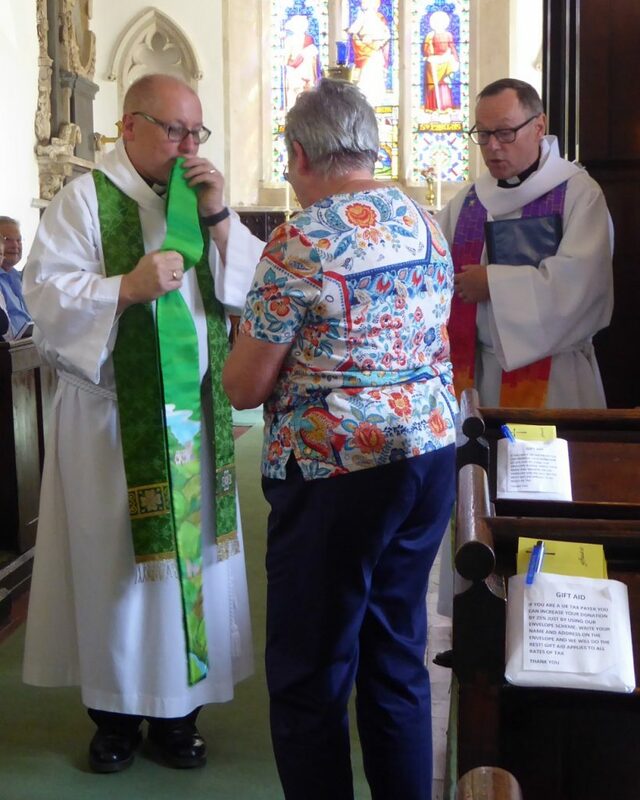 At the close of the service Dave Bell asked Yvonne Bell to come forward and present Ian Smith a specially designed stole she had made which reflects the three Churches of the Benefice together with his two supporting Churches Toddington and Chalgrave. 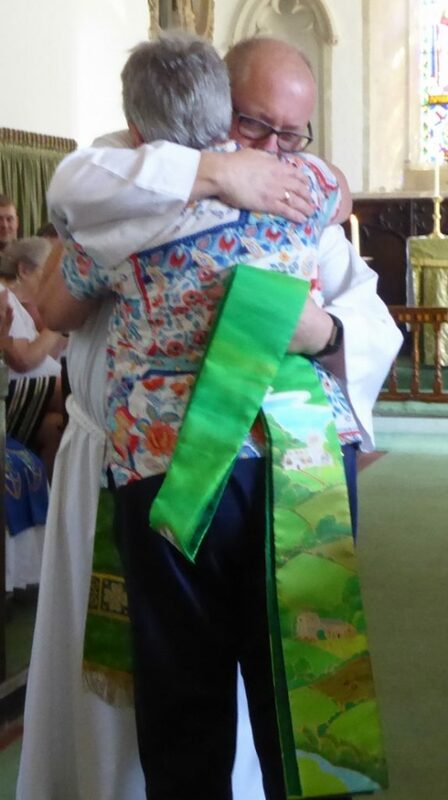 This was clearly an emotional surprise for Ian who thanked Yvonne and blessed his stole before proudly putting it on for the remainder of the service. An emotional Ian thanks Yvonne for his wonderful stole and the picture shows the basis of the design and the settings for the 5 Churches that are depicted. Having recovered from the surprise and shock of the presentation Ian blesses his stole in the traditional manner. 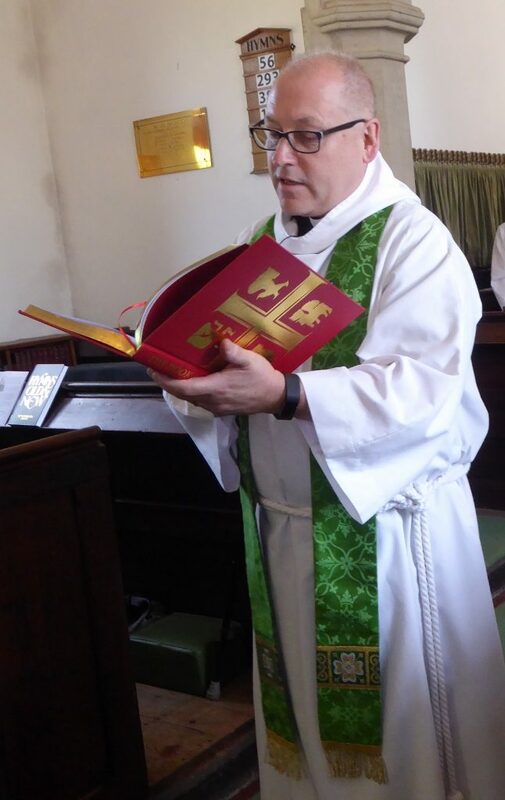 The stole was made possible by generous donations from members of the congregations of all 3 Churches in the Benefice and the monies left after paying for the stole have been given to Ian to help him buy the necessary books for his office and work as a priest. 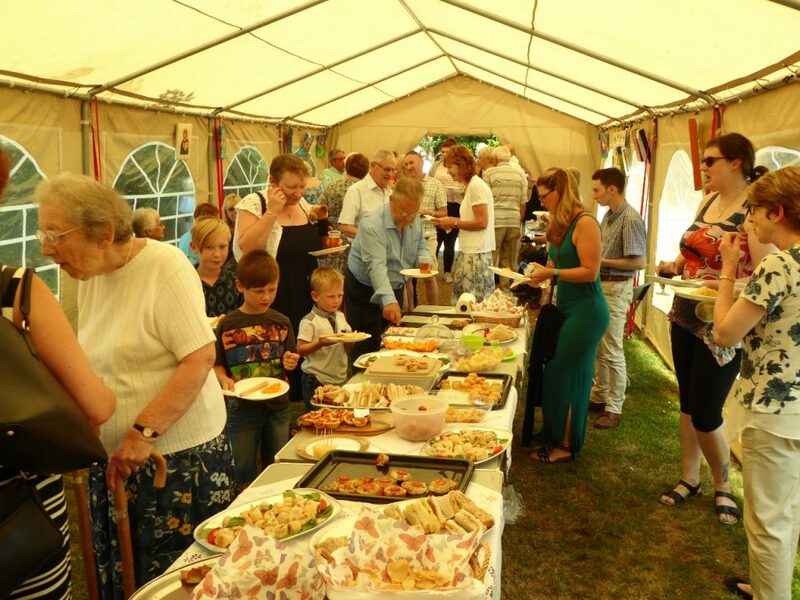 Following the service Pulloxhill had prepared an excellent buffet for the congregation to enjoy, including a wide array of sandwiches, bite-sized savouries and cakes as well as a choice of wines and soft drinks. 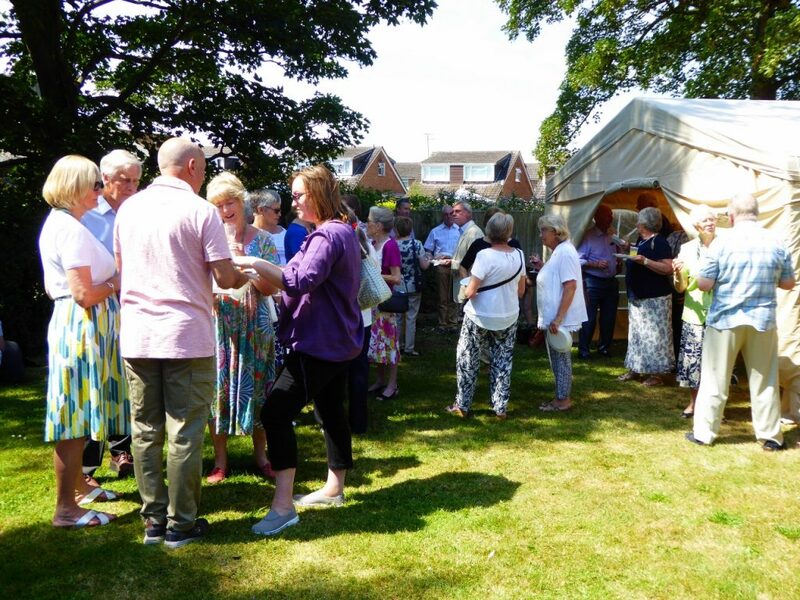 Most of the congregation stayed and enjoyed the opportunity to meet with friends from across the Benefice. 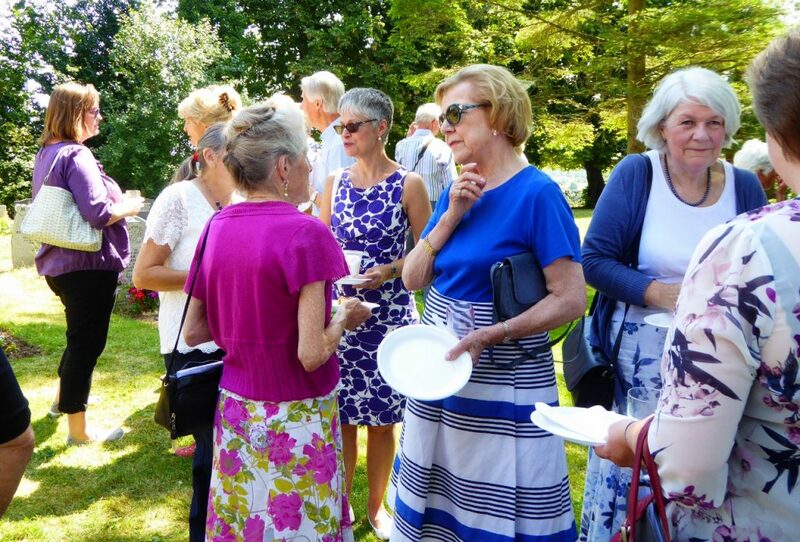 People from across the Benefice take the opportunity to meet and chat with each other.